It is a well maintained, sunny and spacious apartment with a large living area and south-facing balcony with a spectacular view. The view from the bedroom looks directly onto the vineyards. In the autumn you can almost reach out and pick the grapes! Imagine staying in a vineyard in the south of Germany in the middle of a beautiful wine growing region. The vista from the sunny flat looks out onto the characteristic ‘Mosel’ countryside. You will feel perfectly at home here in a child-friendly and relaxed atmosphere. Quell your holiday desires with a visit to us at the winery. Special features: We produce our own wine and can offer you some excellent ‘Mosel’ wine. You are of course welcome to taste it! Our cosy sampling-bar opens in the evenings in the months between July and October. Here, you can experience the wide variety and excellent quality of our wine and satisfy your hunger as well. As a guest, you are welcome to sample our wine outside our opening hours. Spring, summer and autumn at the Mosel: Watch how the vines come to life again in the month of May. Experience how the vines grow in June and the fine fragrance of the grape flowers which cover the mountainside. Our grape harvest begins at the end of September. Everywhere in the region all the wine growers gather their harvest. Perhaps you would want to join in and help one day and learn how to harvest with us. In the evening you can taste the specialities of the region: ‘Federweißer’ (new wine), and ‘Zwiebelkuchen’ (onion quiche). Winter at the Mosel: After the harvest is finished everything quietens down. The autumn leaves fall from the vines and the countryside takes on a new appeal. The mild climate at this time of year is perfect for going for walks and relaxing. Spend Christmas far away from the hustle and bustle of the city and enjoy the piece and quiet at home with us. Yes, we can arrange rental bikes for you. They are available at all sizes. The bikes are serviced at a professional service point that also offers a pick-up and delivery service. 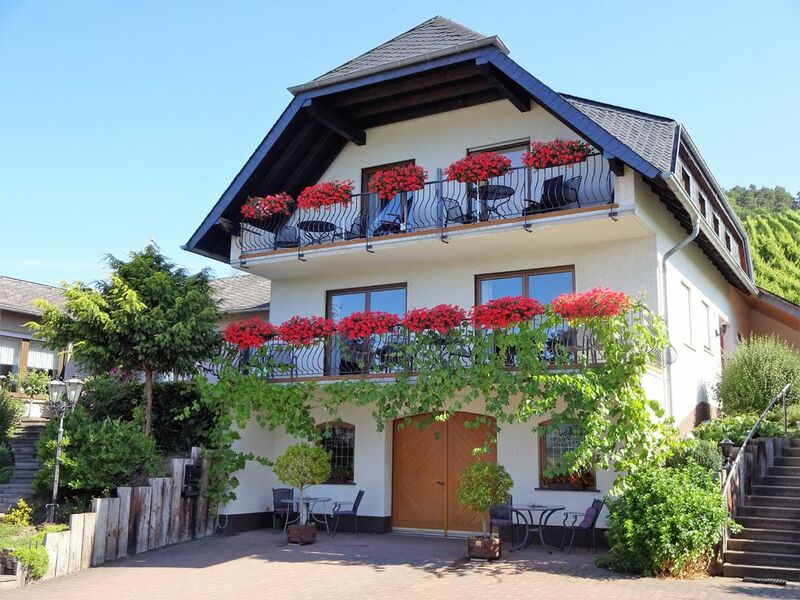 A very nice clean modern apartment well equipped and ideally based for exploring the Moselle. the owners live next door although we had no reason to call on them as everything was excellent.Some of the places we visited were very impressive,BURG ELTZ, NEUMAGEN and best of all TRIER only 20miles away on the Autobahn.We used their park and ride as parking in Trier is expensive for a full day.Wonderful atmospheric centre oozing history ,style,good shops and eating places one day not enough.If you travel by car leave some room in your car to buy the in house wine very good and a very reasonable price.Many thanks to our host for a warm welcome and a relaxing holiday. We have stayed 3 nights there. The owner was very welcoming. She showed around the house, introduced to the recycling rules. We have booked two apartments. One for 6 people (on the 1st floor) and second for 2 people ( on the second floor). They are spacious apartments with the great view from the balconies. From the bedrooms your eyes are relaxing while looking at the vineyards!!! Fabulous. The owners have vinery, where they sell their home made wines and very young brandies. Worth to try. We would like to come there again. We are happy when the guests in the apartments well, and also love our homegrown wines. We always try to offer guests a pleasant stay. My wife and I stayed in the apartment, top-left in the picture. The welcome was warm and the apartment was very clean and spacious, with comfortable furnishings. The rear, bedroom, window looks directly onto the vineyard and the front, balcony, window looks over the street and some houses and over a valley (NOT the Moseltal). All three apartments are accessed by the set of steps shown bottom-right in the photograph, with the upper two accessed by an internal half-spiral. Consider this if, like us, you're travelling with a lot of luggage. The outside steps are very dark at night. The village of Osann-Monzel is very quiet, being set back some kilometers from the main Mosel valley, and has no night-life in the form of bars or restaurants. There is one small shop, with Berkastel-Kues being the closest supermarket. Thanks for the note on the exterior lighting. This was a birthday surprise for my wife. We had a great time. Very welcoming hosts. We would recommend this location to everyone. Wine tasting evening was extremely good. Recently had a week in the wonderful mosel and stopping at the Marmann's winery was just perfect. Luzia was a diamond from the start and was able to converse with us in our native 'english' with relatve ease... The apartment was wonderful and had all we needed and more, including a welcoming drink... Would like to think that the flower boxes survived our week of caretaking !!! All the very best to the Marvellous Marmann's. Gut ausgestattete, geräumige Wohnung für 2 Personen und Hund! Wir waren Anfang November für 10 Tage hier und haben uns sehr wohl gefühlt. Man kann direkt von der Wohnung durch die Weinberge laufen solange man will, an die Moselkante ist es nicht weit und obwohl bereits vieles in der Umgebung geschlossen hatte, wurde es uns nicht langweilig. Wir genossen die Ruhe. Vielen Dank an Familie Marmann und ein Lob für den leckeren Wein! Activities in the charming wine growing village of Osann-Monzel in the hills of the ‘Mittelmosel’ include not only wine-tasting but also trips in to town, the sport-centre and to the surrounding region. From our central location it is possible to travel easily to the cities of Bernkastel, Cochem, Trier, Koblenz or Luxemburg.